When you hire a classic jazz trio via The Jazz Agency in Sussex and London you’re booking a talented group of musicians who add a huge slice of sophistication and fun to your event or party. A classic jazz trio is good for the wallet, doesn’t take up too much space and won’t steal focus from your wedding or networking event. Stacey Dawson – Sax player Stacey is a regular at The Dorchester and The Ivy. A seasoned professional through-and-through, his trios have entertained Prince Charles and Bill Clinton, amongst many others. Ela Southgate – Ela’s trio consists of Ela herself on vocals, plus guitar and double bass. She’s a very mellow singer, perfect for weddings and corporate events where the band is intended for ambience. 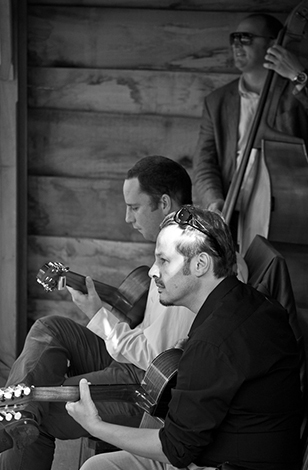 The Jonny Hepbir Trio – Jonny’s gypsy swing trio plays classic jazz tunes from the swing era. Two guitars and a double bass conjure up a lively atmosphere without being overbearing. 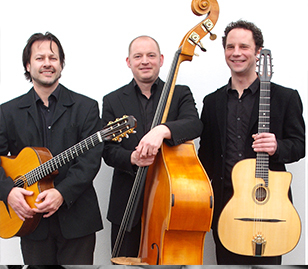 Nigel Price Trio – Guitarist Nigel’s trio plays classic jazz all over the country. As a regular feature at Ronnie Scott’s, you know you’re getting quality musicianship, and at a price you can afford. At The Jazz Agency we try to keep it simple. Just give us a call or send an email with your job specs, even if they’re still approximate, and we’ll get back to you very quickly with a quote. What size place are you hoping your band to perform in? What is your budget for the event? Once you’ve decided that, simply visit our list of classic jazz trios for Sussex and London and have a leisurely browse, listen to them in action, and choose the best one for your wedding, corporate function, or any other event, and then contact us to check on availability, price, and contract.